I'm not sure about you, but if I go on an all day crochet marathon, my hands stage a revolt! Not to mention the large knot that forms between my left shoulder blade and spine. Some might say it's time to take it easy, and they'd be right. But that doesn't mean I can't crochet anymore. I just have to do a few things to keep everything healthy. 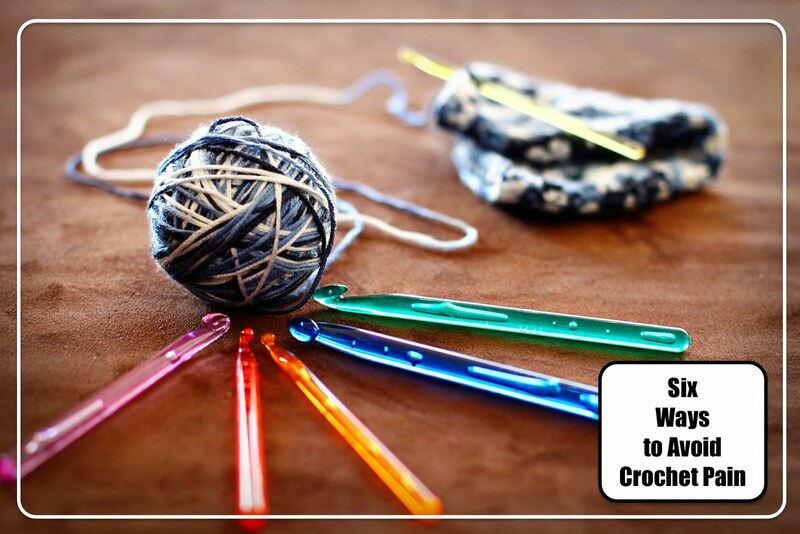 Here's a list of six things you (and I) can do to keep on crocheting! 1. Pace yourself. Do not crochet all day every day. Just like anything else, take periodic breaks and do something different with your muscles. Crochet is a sedentary sport, so get off your hiney and move a little. 2. Stretch every now and then. 3. Massage your knots and sore muscles. I get knots in my forearms. A simple massage with the other hand really helps. For knots in my back or a sore neck I call on my husband or use my handheld massager. This really helps, but be cautious not to go overboard! 4. Posture is key! Check how you're sitting and see if you can improve. Can you add a pillow behind your neck, under your arm? If you have your elbow propped up it can really help with fatigue. 5. Prioritize your activities. When I spend hours on the computer, I can't crochet as long. Or if I color in my coloring book for hours, I am not able to crochet much at all. Any activity that involves fine motor skill is going to affect your crochet game. 6. Take your vitamins and supplements. This might sound like a strange thing but taking vitamins and supplements can help your joint health, which will make crocheting less painful and more enjoyable. Deficiencies can lead to pain and that can cause more trouble with crochet. Do a Google search and see what you come up with. I find all my joints feel the best when I take turmeric. I also take D, fish oil and a multivitamin.